11-year-old Bluebell has been at Freshfields Animal Rescue in Liverpool for so long that she’s like part of the furniture. But even though she’s well loved and looked after there, it isn’t good for a dog to live its life in the noisy, bustling kennel environment. 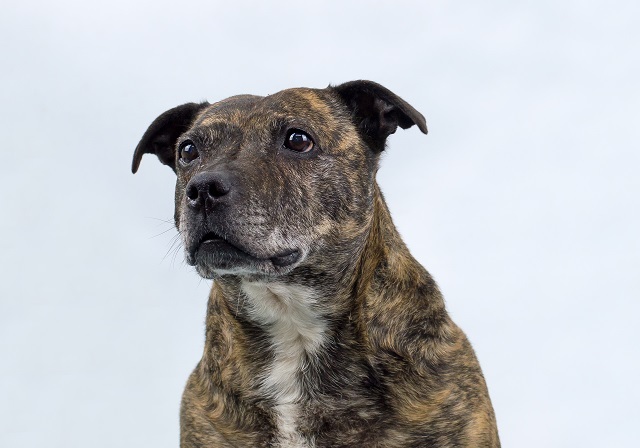 Bluebell needs to find a home for her remaining years. She’s an old lady now and she deserves some peace and quiet and to experience real home comforts and love. Please share this page! You could help Bluebell to finally find her special person. 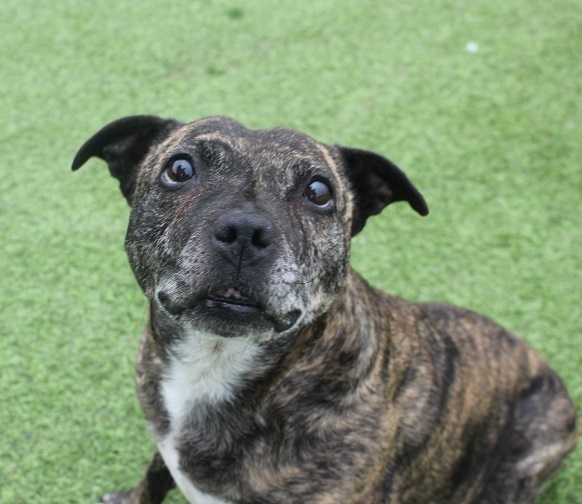 Bluebell arrived at Freshfields in 2008 from a stray pound where she was due to be put to sleep. She has since been adopted twice, but both times was returned for taking a while to settle in. After so long in rescue, Bluebell will need to be allowed lots of time to settle in to home life. She needs a home with someone around most of the time, and she isn’t suitable for inexperienced owners, but she certainly isn’t unrehomable. It’s just that the right home hasn’t found her yet. 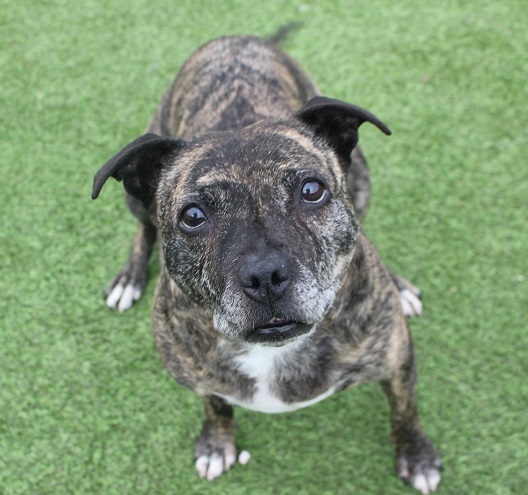 Freshfields would consider a full- or part-time foster arrangement for Bluebell, where her food and vet bills would be covered for life. Please ask them for more details if you think you could help Bluebell. 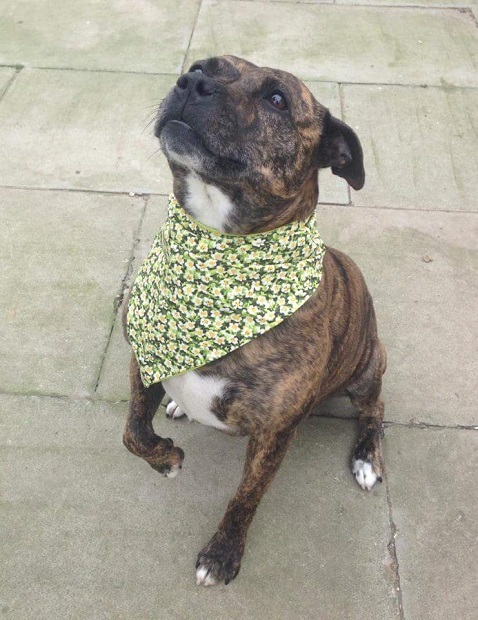 Bluebell is full of character and is lively, friendly and extremely affectionate. 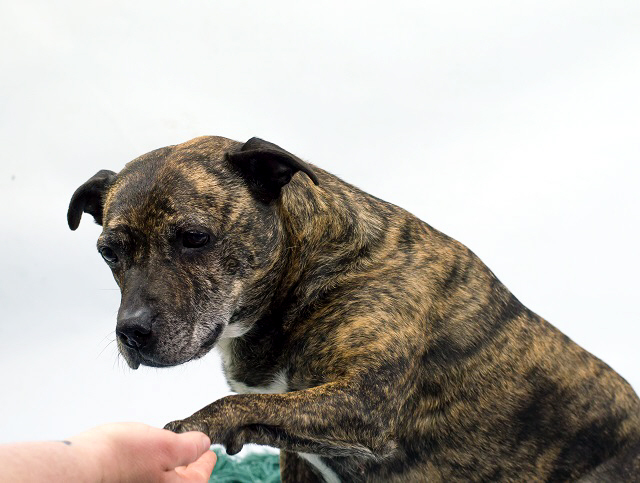 She resides in the kennel kitchen at Freshfields, as it’s a bit quieter than the kennels, and she has all the staff wrapped around her white-tipped paws. She has company all day with the staff coming and going, and there is always an opportunity for her to purloin some extra food! She never misses a dropped biscuit or a treat in your pocket. Being a staffy she also loves to be snuggly, and throughout the winter she presses herself against the radiator, making the most of the heat. Bluebell has many human friends and she loves meeting new people. She goes out every weekend with her favourite dog-walkers who take her for chips at the local pub. Sadly though, Bluebell’s life does have many downsides. 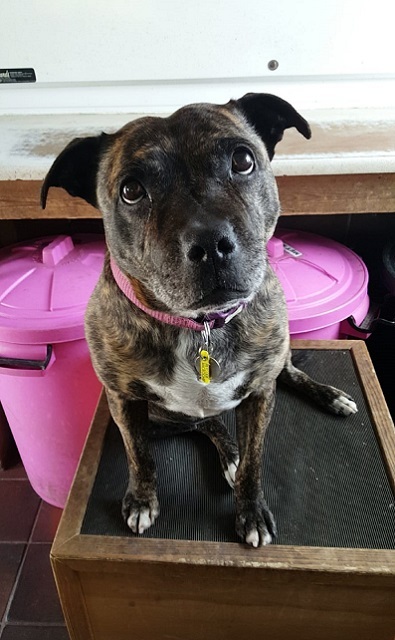 Senior dogs need periods of peace and quiet, time when they can rest properly, but kennel life is a very stressful life and Bluebell doesn’t get much peace as staff are on the go all day. And even though Bluebell interacts with lots of people, she has little consistency in her life and has no one true family to love and devote herself to. Bluebell will make a hugely entertaining companion, but her new owners will need to be able to empathise with Bluebell and genuinely understand her. You will need to allow her lots of time to settle in and get used to life in a normal home, and you will need to be at home most of the time. Bluebell will need a safe environment such as a spare room where she can be left if you need to pop out, as she can be destructive when left alone and doesn’t cope with being locked in a crate. She will need to go back to basics with housetraining as, after so long in kennels, she has got used to toileting inside when the need arises. 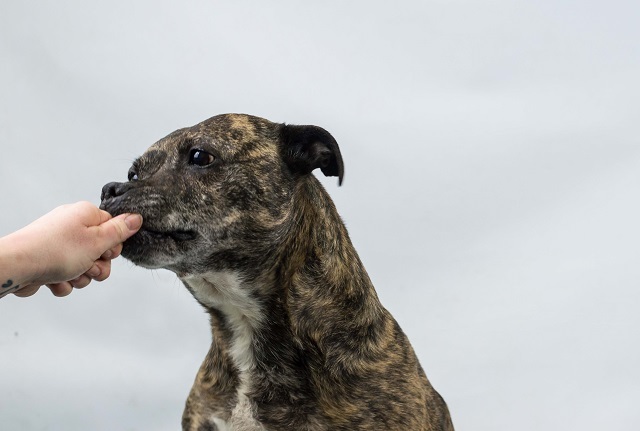 In kennels, when she feels stressed, Bluebell will tug on staff’s clothing for reassurance, or jump up and grab things out of their hands. This is really not her fault, she just has a strange life in a stressful place with no real consistency, and she is trying to cope the only way she knows. Once she has settled into home life and feels more relaxed and secure, this should improve, but you will need to be calm and not make it worse by your reaction. She cannot live with children, because sometimes she accidentally grabs skin along with clothing, but she is a very friendly and loving girl and is certainly not trying to bite. Tugging on clothes is her reaction to a situation she cannot cope with. Poor Bluebell. She will happily ignore dogs when she is on the lead, but she doesn’t want to live with dogs or other pets. She likes to make her feelings known by being quite vocal (usually when she isn’t getting her own way!) and although she can sound a bit intimidating at times, she certainly means no harm by this. It is just the way in which she expresses her frustration. Freshfields say that Bluebell is like a puppy trapped in an adult dog’s body as she was never taught coping skills as a young dog. Bluebell is a clever girl and is very food motivated, so with some consistency and boundaries in place, and with treats as rewards, she will truly flourish. In 2016, Bluebell had surgery to fix a cruciate ligament, and in the summer of 2018 she had surgery once again for the other cruciate. 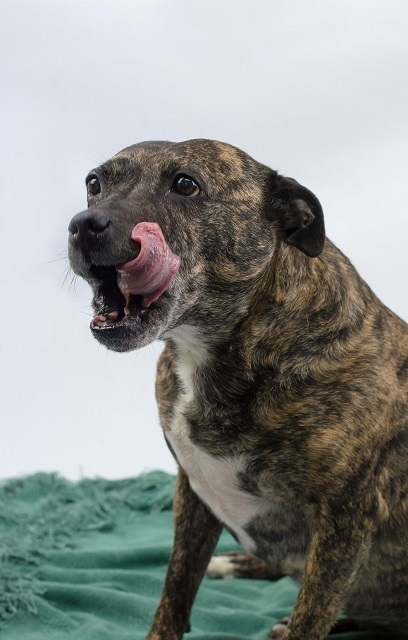 Although she has made a full recovery, she is not as steady on her legs as she used to be – although she still thinks she is – and can no longer manage long walks, so short strolls suit her best. Earlier this year Bluebell also developed a cough and now requires medication twice a day. She is also on supplements to strengthen her joints. 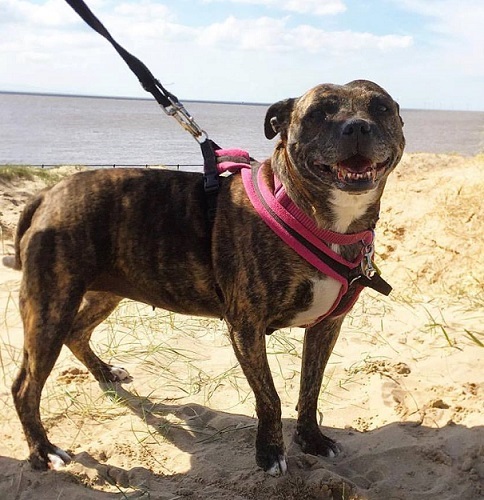 Bluebell is an adorable, affectionate, beautiful girl who needs an experienced owner – someone who has had rescue dogs before and understands that they need a lot of time and patience to settle in. 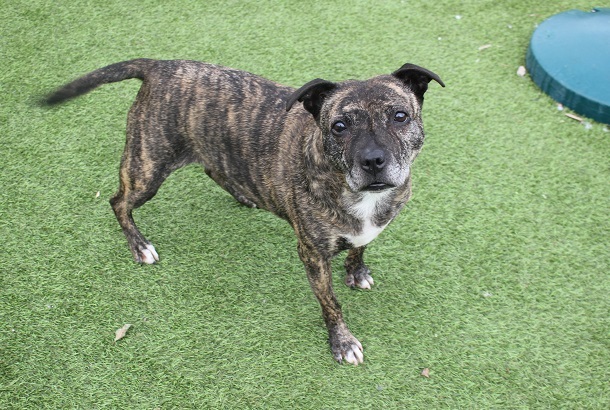 If you would like to adopt Bluebell, you would need to make several trips to Freshfields and take time to slowly introduce her to your home. If you could give Bluebell the chance she desperately needs, you will, in time, have the most amazing and entertaining friend. You will feel immensely proud that you were the person that gave this special girl the life she truly deserves. Could you help Bluebell? Please mention that you saw Bluebell on the Oldies Club website. This replaces Bluebell’s original page dated 24 October 2014.